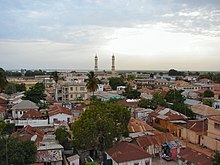 Príomhchathair na Gaimbia in iarthar na hAfraice is ea Banjul. Tá an chathair suite in iarthar na tíre ar St. Mary's Island, oileán ag béal Abhainn na Gaimbia ar chósta an Aigéin Atlantaigh. Calafort na tíre atá ann. Bhí 34,848 duine ina gcónaí sa chathair féin agus 350,000 i mórcheantar na cathrach sa bhliain 2013. Bunaíodh Banjul sa bhliain 1816. "Bathurst" an t-ainm a bhí ar an gcathair in aimsire na coilíneachta Briotanaí. Tugadh an leathanach seo cothrom le dáta an 15 Aibreán 2017 ag 06:43.